Regular readers of the blog might have noticed a few references recently to Half Pint Vegan Dairy butter. I am so in love with this butter that I thought it deserved a short post of its own. I’m onto my third tub. I originally bought a tub to do some baking. Butter behaves differently in baking because it is hard when chilled, unlike margarine. This is important to make anything that requires the butter to be layered such as pastry and croissants. Margarine just melts so no layers are formed. Anyway to cut a long story short I didn’t end up doing any baking, I just scoffed the lot. On toast, on crumpets, in dhal, in sandwiches. I love it. I love its cute retro packaging. I love that it has a short list of recognisable ingredients. I love that it is locally made by a small business. And most importantly it tastes good. I will get round to baking with it at some point, but meanwhile I am enjoying it just on its own. I got mine at Mad Cowgirls Vegan Grocery. It is also available at The Cruelty Free Shop, Terra Madre and the Prahran Convenience Store. Agree! This stuff is delicious and addictive. Very similar texture and flavour to cows milk butter. Great slathered on toast. 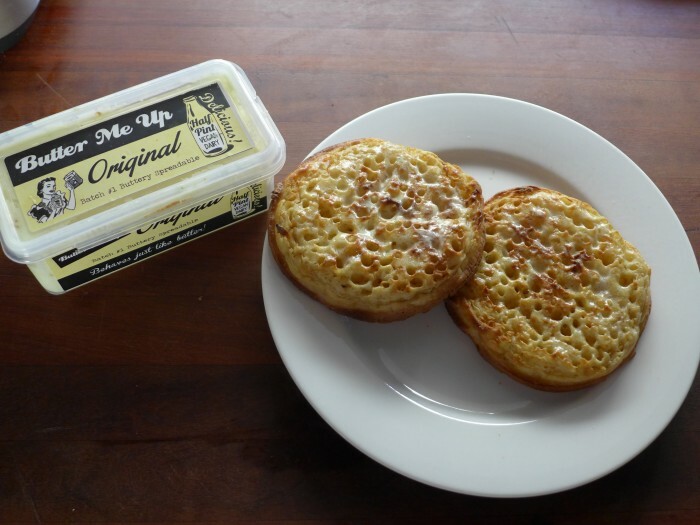 Must buy some crumpets! Yes, I’m almost sorry I found it…almost. Hi Annie, I love it too. When they announced on their facebook page that they were having a short break in supply due to a holdup in their delivery of coconut oil I bought a couple of tubs and froze one. I agree it works perfectly. I suggest you post your comments on their facebook page, though I really doubt they will change the flavour. I love it as it is too. The butter will be back soon. I asked on the facebook page the other day.